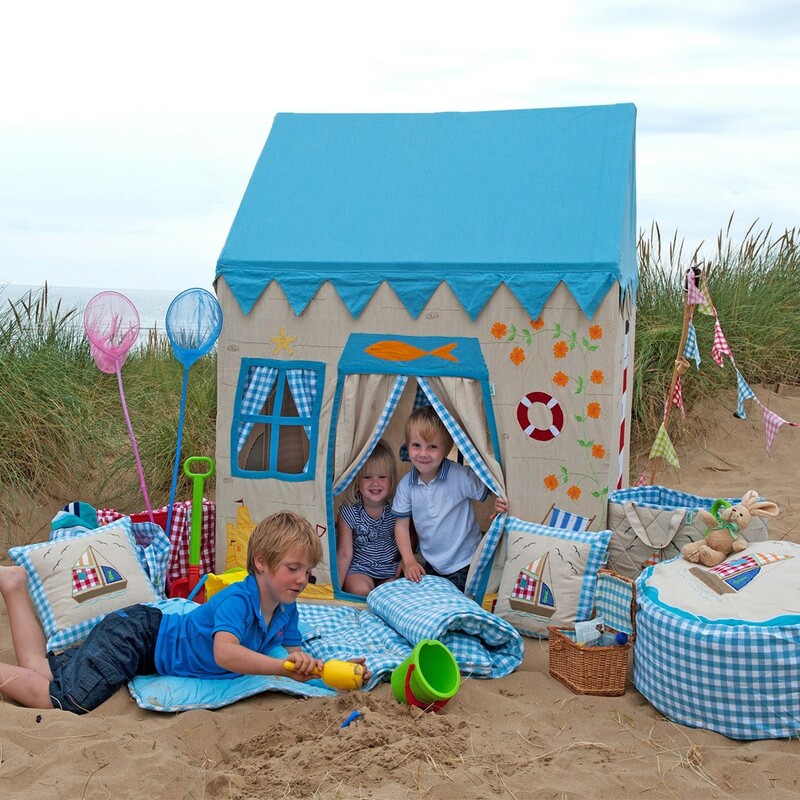 Who would like to have a day of sandcastle fun in our Beach House?! Our seaside pad is perfect for girls and boys alike, appliqued and embroidered with a beautiful sail boat, lighthouse, deckchair ... even a cup of tea awaits! This playhouse is sure to inspire your child's imagination and supply year round fun! Made of high quality hand-woven and hand-dyed 100% cotton. Who would like to have a day of sandcastle fun in our Beach House?! Our seaside pad is perfect for girls and boys alike, appliqued and embroidered with a beautiful sail boat, lighthouse, deckchair ... even a cup of tea awaits! This playhouse is sure to inspire your child's imagination and supply year round fun! We also offer matching accessories: cushion covers, toy bag, bean bag, and a floor quilt. * Recommended for indoor use, do not leave outdoors overnight. About Win Green: Win Green's playhouses are made from extremely durable hand-woven and hand-dyed 100% cotton and come in a stunning range of colors and designs. Each playhouse is beautifully crafted by their highly talented and skilled workers in India. Typically, each playhouse takes 15 sewing hours to complete and it is this attention to detail that makes Win Green’s products so special. Over the last 11 years, the production of our playhouses has helped empower rural women in India to gain financial independence and support their families. Their expertise and enthusiasm has led to the tremendous success of Win Green.